Maison Souquet – is a mini hotel, which is located a few steps from the Moulin Rouge and Pigalle, in the heart of Montmartre. The hotel is inspired by the reputation of neighborhood. This nineteenth-century Belle Epoque building was a house of pleasure, which between 1905 and 1907 contributed to the reputation of Paris as a city notorious for sexual immorality. 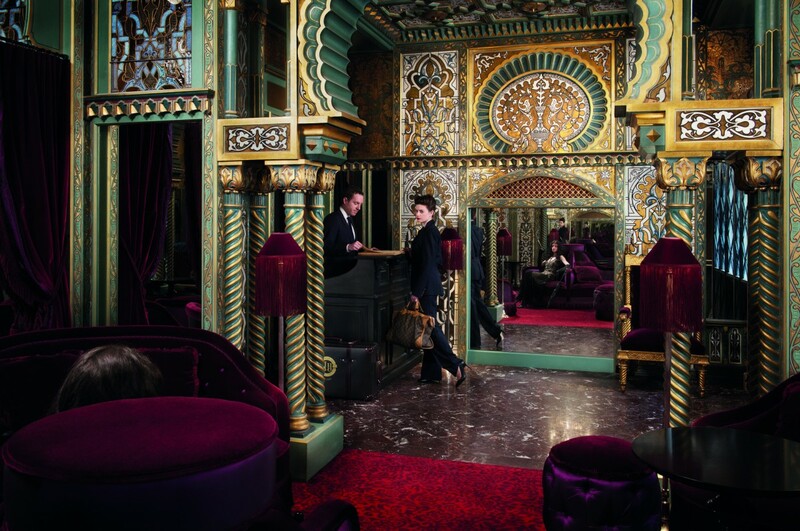 Currently, it is one of the most unusual hotels in Paris which blends historical charm with modern comfort. The past of the building affects the hotel itself, which lives under the same laws of drama. Entrance to the lobby looks like entrance to the hall of the Moorish Palace of 1001 nights. Style of the living room with colorful stained glasses, red seats and decadent chandeliers was defined as "gothic sexuality"
Each room (there are three categories of rooms in the hotel: deluxe, junior suite and two apartments) is named after the most famous courtesans (Liane de Puzhi, La Belle Otero, Teresa la Paiva or Virginia Castiglione) and creates its own specific atmosphere, tender and impudent at the same time, it smells the house of tolerance, along which maidens defile dressed in corsets you can not see in our time. Canopies, shimmering fabrics, fringe, satin, chinoiserie, crisp white linen, which is in stark contrast to the dim light, an eclectic collection of furniture and works of art - each of these rooms is made like artsy boxes and could be a place of stay of one of corseted ladies who were as keen for as close an approach to pagan pleasure and took a rest in the lazy luxury bed or on the lap of a client. Six junior rooms seem to create the whole presence of the famous courtesans, who ceremoniously walked up and down the black-and-gold alcoves in the neoclassical style. Their provocative pompous 19th century portraits cover the walls and give a flavor of bliss and relaxed luxury. And a faint of their perfume, with a notes of rose, jasmine and tobacco radiates to nostrils. Unlike the voluptuous clients of the 19th century, lovers as well as a diverse bohemian crowd hurry here in search of small pleasures and romantic weekends. Pretentiousness of deluxe rooms can amuse vanity of any movie star. The cozy atmosphere is perfect for business meetings. The hotel is not suitable for those who are alien to the idea of ​​spending time in the walls of the "temple of hedonism" and who does not like pretentious luxury. 1. The usual attributes of a five star hotel: a spa, Turkish bath and a lounge area. Most rooms have tiled showers, baths - a few. 2. Perfect 10-meter swimming pool under the ceiling in the form of a shimmering starry sky of blue and gold, and a hammam. 3. The open garden with a glass shed, stone statues and the walls are covered with ivy and jasmine - a secluded place for meditation and relaxation. The staff is very attentive and discreet. Despite being a 5-star hotel, the hotel Maison Souquet has no restaurant. Breakfast consists of appetizers: cheese (burrata, manchego), artichokes, foie gras and bresaola, bread and croissants, eggs, cheese or smoked salmon. The bar called "beating heart" offers alcoholic and non-alcoholic cocktails, along with excellent cognac and calvados. The business card of the bar - "The Secrets of the Unicorn" - a rum-based drink, which is brought from the cellars of Burgundy. Afternoon tea - a sort of ritual at the hotel. Tea Room is located in the living room, where you can taste the varieties of elite tea under the guidance of a sommelier. Breakfast could be a little more generous and original for a hotel of this status. Double € 375 (£ 266), a junior suite from € 615 (£ 436). breakfast is included.​ Hotel Maison Souquet with gothic and sexual atmosphere noticeably distinguishes among the best hotels in Paris.